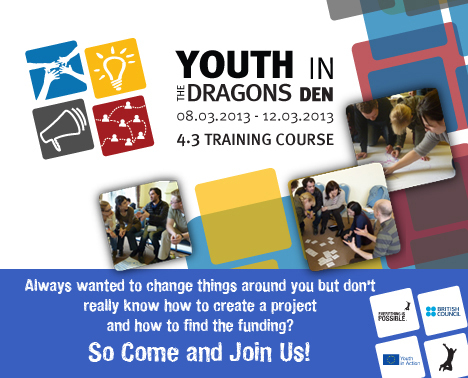 Always wanted to create your own project for your local community without really knowing how to proceed? Always wanted to change things around you but don’t really know how to create a project and how to find the funding? - build confidence and stimulate initiative. - gain hands on experience of being a leader as well as a team player. - give you methodology to build your own project especially through the creation of a fictional (or possibly real) Youth Initiatives application and using the well-known television programmes ‘Dragon’s Den’ and The Apprentice as the theme for what we hope will be an inspiring event. This training will take place in LONDON from the Friday 8th (evening) to the Tuesday 12th (lunch time) March 2013. This training is free.